European power markets have become more integrated and renewables have a significant effect on power prices and cross-border exchanges. This paper investigates empirically how the effects of renewables are affected by market expansion across two adjacent countries (France and Germany), based on market data and proprietary data on book orders. We find that wind production lowers power prices on average and increases volatility, not only domestically but also across borders. Using multiple counterfactuals, we examine how our results depend on the level of interconnection and find that further interconnection capacity would decrease price volatility in both countries since the benefits of a larger market would outweigh the contagion effects of volatility. Our findings have important policy implications as they demonstrate the need to coordinate support policies for renewables and policies to support transmission capacity expansion in order to mitigate the impact of volatility on power prices in neighboring power markets. This paper studies the effect of oil price shocks on U.S. state-level unemployment rates. First, using a test of symmetry, I evaluate whether the relationship between oil prices and state unemployment rates is symmetric. I find no evidence against the null of symmetry after accounting for data mining. Second, I use a symmetric structural VAR model to analyze the effect of oil supply shocks, aggregate demand shocks and oil-specific demand shocks on state unemployment. I find that an adverse supply shock triggers increases in unemployment, whereas a positive aggregate demand shock reduces the unemployment rate across most U.S. states. I also show that oil-specific demand shocks have little effect on state unemployment. Finally, I dig into the historical contribution of the various oil shocks to the changes in state unemployment rates during the shale boom period. I find that aggregate demand shocks contributed the most to the change of unemployment. Some restructured power systems rely on audited cost information instead of competitive bids for the dispatch and pricing of electricity in real time, particularly in hydro systems in Latin America. Audited costs are also substituted for bids in U.S. markets when local market power is demonstrated to be present. Regulators that favor a cost-based design argue that this is more appropriate for systems with a small number of generation firms because it eliminates the possibilities for generators to behave strategically in the spot market, which is a main concern in bid-based markets. We discuss existing results on market power issues in cost- and bid-based designs and present a counterintuitive example, in which forcing spot prices to be equal to marginal costs in a concentrated market can actually yield lower social welfare than under a bid-based market design due to perverse investment incentives. Additionally, we discuss the difficulty of auditing the true opportunity costs of generators in cost-based markets and how this can lead to distorted dispatch schedules and prices, ultimately affecting the long-term economic efficiency of a system. An important example is opportunity costs that diverge from direct fuel costs due to energy or start limits, or other generator constraints. Most of these arise because of physical and financial inflexibilities that become more relevant with increasing shares of variable and unpredictable generation from renewables. An important methodological issue in efficiency analysis for incentive regulation of utilities is how to account for the effect of unobserved cost drivers such as environmental factors. We combine a spatial econometric approach with stochastic frontier analysis to control for unobserved environmental conditions when measuring efficiency of electricity distribution utilities. Our empirical strategy relies on the geographic location of firms as a source of information that has previously not been explored in the literature. The underlying idea is to utilise data from neighbouring firms that can be spatially correlated as proxies for unobserved cost drivers. We illustrate this approach using a dataset of Norwegian distribution utilities for the 2004-2011 period. We show that the lack of information on weather and geographic conditions can be compensated with data from surrounding firms. The methodology can be used in efficiency analysis and regulation of other utilities sectors where unobservable cost drivers are important, e.g. gas, water, agriculture, fishing. Interconnections for cross-border electricity trade improve price convergence and welfare. Increased production from variable renewables however implies higher levels of optimal interconnection capacity than in the past. Rather than using scenario building to determine new optimal levels of interconnection capacity, this paper presents a new methodology for Cost-Benefit Analysis (CBA) based on empirical market data, using the French-German electricity trade as an example. Employing a very fine dataset of hourly supply and demand curves (aggregated auction curves) from the EPEX Spot market, it constructs net export (NEC) and net import demand curves (NIDC) for both countries. This allows assessing hourly welfare impacts for incremental capacity and, summed over the year, the annual welfare benefits for each discrete increase in interconnection capacity. Confronting benefits with the annualised costs of increasing interconnection capacity determines the socially optimal increase in interconnection capacity between France and Germany on the basis of empirical market micro-data. Efficient operation of power systems increasingly requires accurate forecasting of load and variable energy resources (VER) production, along with flexible resources and markets, capable of adapting to changing conditions in the intraday horizon. It is of utmost importance to reflect these needs in price signals, to align the incentives of market agents with the new challenges. The two-settlement system used by U.S. ISOs falls short to provide efficient intraday economic signals and a cost reflective allocation of intraday rescheduling costs. This paper advocates for a multi-settlement system, which entails calculating intraday prices as forecasts are updated and re-schedules are executed. This approach incorporates more granular prices, as in European intraday markets, while keeping the efficient centralized dispatch logic of the ISO model. A stylized case example illustrates the virtues of a multi-settlement system, which sends cost reflective signals, and consequently facilitates VER integration. There are possible synergies between the decision to invest in energy efficiency measures and to adopt renewable energy, in the sense that the former reduces energy demand so that the latter can further cut future greenhouse gas (GHG) emissions, and which has great potential in the residential sector. Much work has been done in the residential sector on demand for clean energy and on investment in energy efficiency, but to our knowledge there is no specific study that investigates the relationship between the two. This paper fills a gap in the literature, and first shows theoretically that there are relationships of substitution or complementarity between the two decisions depending on the threshold of the cross effect related to the environmental motivation of the consumer. Second, the paper empirically shows that the two decisions are positively interrelated due to unobserved characteristics that determine both decisions. Third, the paper provides differential impact of energy poverty, split incentive problem, dwelling characteristics, commitment and trust on the two decisions. 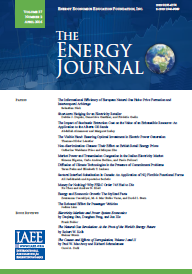 Finally, the paper investigates household characteristics that significantly affect the joint adoption of energy efficient and renewable energy technologies. This contribution can serve to define incentive policies to advance the energy transition. The introduction of renewable energy paid off-market disrupts the demand-price relationship in wholesale electricity markets. Drawing on 2015 hourly data from France's electricity transmission network operator (RTE) and the French day-ahead spot market, this paper attempts to quantify the disturbance observed and the transfers of revenues among consumers, producers and providers. This study calculates, through a modeling of the day-ahead market, the impact on conventional electricity producers in France in terms of the loss of economic value owing to the introduction of renewable energies. In the same time consumers benefit from lower electricity prices but have to pay for feed-in tariffs. Renewable electricity producers and electricity providers are also the winners. An estimation of the cross-subsidies induced by the injection of renewable electricity is given.